From the moment you held your baby for the first time, you knew how important it was to protect her little head, and it's even more important now that she's taking off on two wheels. You want to choose a helmet that's comfortable, stylish, and most importantly, safe. Here are our top picks for the best bicycle helmets for kids. When looking for the ideal helmet for your child, you’ll want to consider a variety of both safety and comfort factors. After all, if a helmet is uncomfortable, your kid won’t want to wear it. The table below lists some of the most important features of our top helmet picks and shows how each helmet stacks up against the competition. It can be tricky to find a helmet that fits smaller heads, but parents love that the Giro Scamp offers the latest safety technology and fun designs in a size that fits children from twelve months up to age five. The only downsides to this helmet were a few minor convenience issues. The Giro Scamp MIPS incorporates a Multidirectional Impact Protection System to allow the helmet to absorb more impact from a nondirect hit. This technology adds an extra layer of protection to the helmet.There is some debate in the cycling community about the effectiveness of MIPS, with some saying the extra cost outweighs any measurable benefits. Giro offers the Scamp in both MIPS and non-MIPS versions, allowing parents to decide whether or not it’s worth the higher price tag. The back of the helmet has a low profile, making it ideal for younger children riding in a seat on the back of a parent’s bike or in a bike trailer. Leaving long hair down while wearing a helmet can lead to overheating in warm summer months. The Giro Scamp is equipped with a vent at the back of the head to allow for ponytails. Kids grow a lot between one and five years of age, and we like that the Giro Scamp can grow with them. Its adjustable Roc Loc Jr. system can expand and contract the interior of the helmet for a snug fit from trailer to training wheels. It’s easy for little chins to accidentally get caught in a standard quick-clip buckle, but the Giro Scamp’s chin strap features a buckle guard for a pain-free start to every ride. 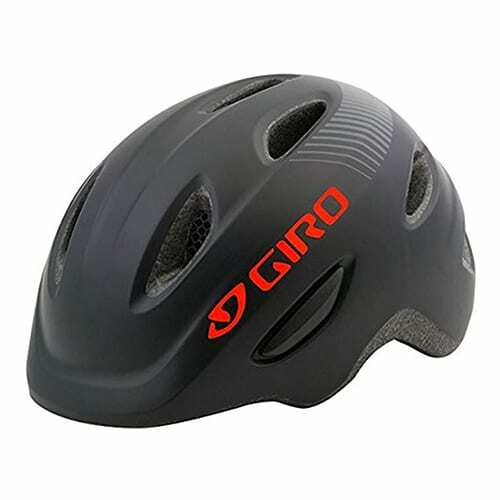 Most children’s helmets have fifteen or more vents to allow for air circulation, but the Giro Scamp has only eight, which could leave your little one feeling sweaty. Parents’ main complaint about the Giro Scamp was that the chin strap would loosen during the ride, and they had to tighten it frequently. 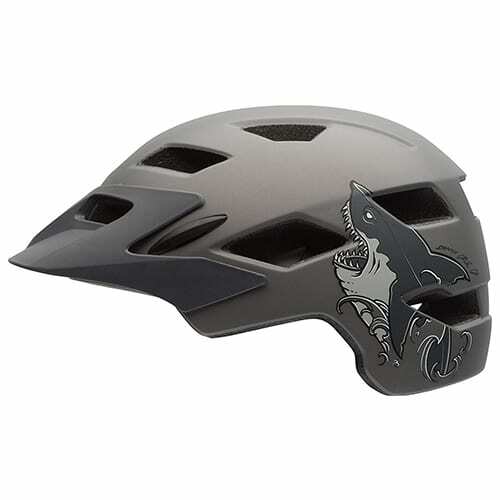 With a cool shape that will make your kid feel like an X-Games pro, the Razor V-17 is stylish and comfortable, and it offers more protection than a typical bike helmet. It’s also inexpensive and comes in a wide range of colors, but depending on your child’s head shape, it might not be the best fit. This helmet is designed for biking, skateboarding, and scooters—you can even use it as a ski helmet or for other snow sports. It’s an all-in-one helmet, so you don’t have to mess around with multiple helmets for different activities. 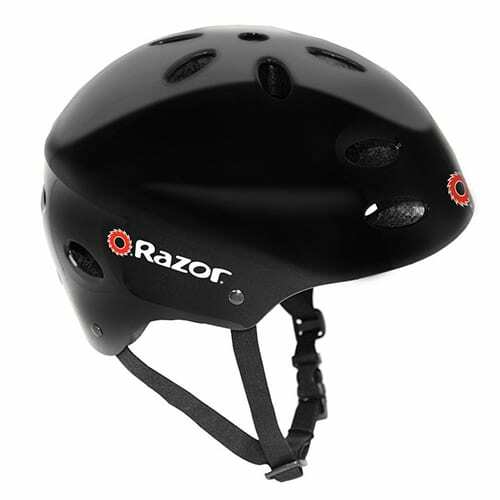 Most bike helmets only come down about halfway on the back of the head, but the Razor V-17’s multi-sport design covers the entire back of the head, giving your child full protection. Parents say their children prefer this helmet over other bike helmets due to its comfort and trendy design. The seventeen vents help keep riders cool, and the variety of designs appeal to all different ages and personalities. At around $20, the Razor V-17 gives your kid great protection at an affordable price. The Razor V-17 touts high ratings for impact absorption. Because the V-17 is a multi-sport helmet, it’s heavier than other standard bike helmets. The only way to adjust how the V-17 fits is with pads and the chin strap, and reviewers say that it’s tricky to get a snug fit. No visor means less eye protection from the sun and less face protection in case of a crash. The Bell Sidetrack has a trendy, mountain-bike style design, and safety experts give it top ratings for crash protection. It’s priced reasonably, and its extra comfort features put it near the top of our list for best kids’ bike helmets, but there’s a trick to getting it to fit properly. The Sidetrack has a sturdy snap-on visor that provides excellent sun and rain protection. The youth version of the Bell Sidetrack comes in a MIPS version (that’s a Multidirectional Impact Protection System), but it costs about $20 more than the non-MIPS helmet. The padding is strategically placed to cover the MIPS anchors, which prevents a child’s hair from getting caught in them. The Sidetrack’s tri-glide sliders keep straps securely in place much better than the traditional sliders found on many other models, and they’re also easy to adjust if needed. We like that the Sidetrack still looks like a classic bike helmet but has more coverage for the rear of the head than traditional bike helmets do. If your helmet is defective, you can contact Bell customer service within one year and get a replacement helmet. The placement of the dial on the interior of the helmet’s cage makes it difficult to reach when you’re trying to adjust it on your child’s head. We recommend getting it as close to a good fit as possible while it’s on their head, then taking the helmet off to make any additional adjustments. The Bell Sidetrack has quite a bit of excess strap that can bunch up next to the face. It won’t affect the safety of the helmet, but kids might find it annoying. We recommend cutting off the extra strap and melting or taping the ends to prevent fraying. The Bontranger Solstice has a Headmaster dial system to ensure a secure fit, and it’s one of the most lightweight helmets on the market. Reviewers give it top marks for impact absorption, fit adjustments, and ease of use. And don’t worry if you crash—Bontranger will send you a replacement helmet if your Solstice gets damaged in a crash within the first year after you buy it. When it comes to looking awesome, the Krash Vector Victor multi-sport helmet takes the prize. Any kid will be eager to wear a helmet that’s sprouting a Mohawk. But it’s not just about looks—the Krash is certified by the Consumer Product Safety Commission (CSPC) and the American Society for Testing and Materials (ASTM), and it has vents to keep your child feeling—and looking—very cool. Just be careful when storing it, as some parents say the silicone spikes can easily get bent out of shape. Lazer was one of the first companies to start including MIPS technology into their youth helmets, and their Autofit system works with a tension cage inside the helmet, so you don’t have to mess around with pads or a dial. Locking slider clips on the straps also helps ensure a proper fit, and the interchangeable casings for the P’Nut version (for toddlers) are a fun way for kids to personalize their helmet. The only downside is that the Autofit system may not work as well for kids with longer hair— parents say the helmet can become loose during cycling. The Nutcase Little Nutty Street Bike Helmet fits heads 48–52 cm. and can be adjusted for fit with both a dial and pads. The magnetic buckle allows kids to fasten their helmet on themselves, and the padding on the strap makes it extra comfortable on little chins. The back of the helmet is flat enough for it to work well riding in a bike seat or trailer, and the reflective paint helps with visibility. The only complaint from parents was that the detachable visor came off too easily and needed to be secured. This one isn’t available to the public quite yet, and its Junior size is recommended only for kids twelve and up, but we couldn’t help but mention this smart helmet in our list because of its cutting-edge safety features. Front and rear cameras scan the environment to alert the wearer to traffic, and you can livestream and record your ride, which means that you could keep an eye on your children as they ride to school or cruise the neighborhood. Gesture sensors and a gyroscope inside the helmet activate turn signals and brake lights, alerting drivers to the rider’s movements. Smart helmets like the Classon Intelligent are definitely a trend to watch, and we hope to see smart youth helmets on the market soon. EPS stands for Expanded Polystyrene. It’s the same kind of foam used to make disposable picnic coolers. A higher-quality EPS is often used to make bike helmets because it’s both rigid and lightweight. MIPS stands for Multidirectional Impact Protection System. Swedish scientists developed MIPS technology for bike helmets to reduce stress on the skull from rotational impacts. It cradles the head in a second inner shell that attaches to the outer helmet shell with elastic bands to absorb impact and allow the head to rotate in a controlled way during a crash. The biomedical team who developed MIPS actually based its design on the way the brain is naturally protected inside the skull. How can I tell if my child’s bike helmet fits correctly? The helmet should be snug on their head and come just to the top of their ears. If your child’s eyebrows move when you shift the helmet on their head, that’s a good indicator that it’s snug enough. The strap should be tight against their chin when they open their mouth all the way but loose when their mouth is closed. The helmet should rest on the forehead about two adult finger widths above the eyebrows. What’s the difference between traditional helmets and multi-use helmets? A traditional bike helmet is lighter and has more vents than a multi-use (skater style) helmet, so kids often find them more comfortable. But multi-use helmets are usually dual-certified, so they can be used for biking, riding a scooter, skateboarding, and more. Plus, they often provide a better fit for kids with oddly shaped heads. Multi-use helmets can offer more protection for the back of the head as well. What is the difference between in-mold and hardshell construction? All helmets have an inner EPS (foam core) layer and an outer plastic shell. Bike helmets are usually made with in-mold construction, where the EPS is fused to a thin plastic shell, keeping the shell from cracking or separating from the helmet. With hardshell construction, the plastic shell is thicker, so it can’t be fused to the EPS. Instead, it’s glued to the foam core. ASTM standards require multi-use helmets to be more durable than bike helmets, which is why multi-use helmets are usually hardshell. What’s the difference between CPSC and ASTM certification? The CPSC (Consumer Product Safety Commission) is a US government organization that certifies US bike helmets for safety based on a specific set of cycling safety standards. The ASTM (American Society for Testing and Materials) is an independent, international nonprofit organization that tests and certifies multi-sport helmets for everything from horseback riding to snowboarding to mountain biking. For bike helmets, look for a helmet that’s at least CPSC certified. 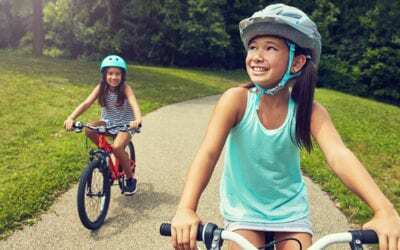 To research the best bike helmets for kids, we studied the products available on the market, checked out what others were saying about them, and looked for products that consistently received favorable reviews and high ratings. Learn more about our methodology.